Practically invisible - the aligners are virtually invisible so others will not even know you're straightening your teeth. 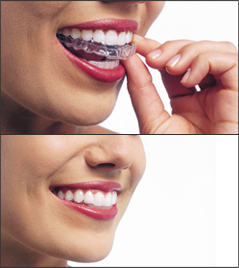 Removable - unlike traditional braces, you can take these aligners off for eating, drinking, brushing/flossing etc. Comfortable - there are no wires or meshes in your mouth. Discuss your goals - In your first visit, Dr. Sharma will evaluate your case and discuss your goals so that a personalized treatment plan can be created. Impressions - After you've decided to go for Invisalign®, Dr. Sharma will take impressions. 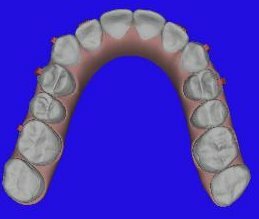 Fabrication in Invisalign® studio - Dr. Sharma will transmit data to Align Technology Inc. Advanced 3-D computer technologies are put into play in creating a set of customized aligners. Wear aligners - You wear each pair of aligners for 2 week periods. The aligners help move your teeth gradually, little by little, till you get the smile that you always dreamed of. Dr. Sharma is an Invisalign® certified dentist. She has undergone specialized Invisalign training to deliver you the best results. She has a lot of experience and has helped several patients in the Bay Area using this revolutionary technology. 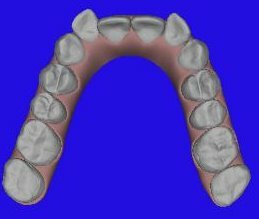 3-D animation of tooth movement with Invisalign® - one of Dr. Sharma's patients. The 3-D animations shown below are those of one of Dr. Sharma's Invisalign® patients. The before and after images show how Invisalign® straightens your teeth and gives you a smile makeover. For more cosmetic dentistry options, visit our cosmetic dentistry page here.